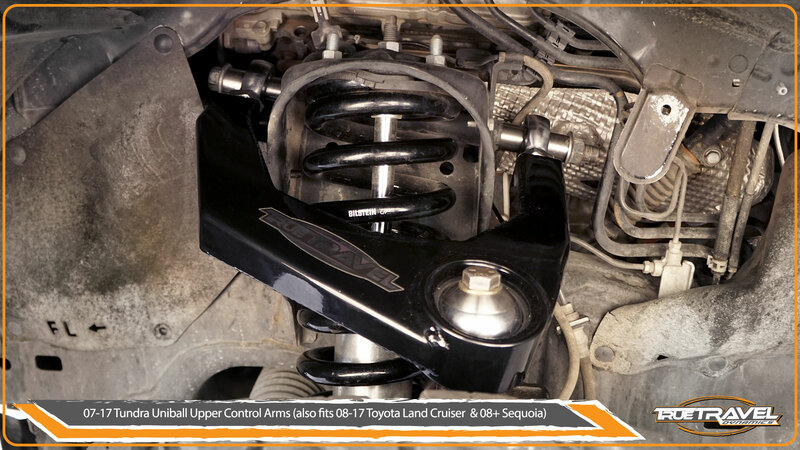 Make your Tundra perform better on and off-road with a set of True Travel Dynamics Uniball Upper Control Arms (UCAs). Don’t let the factory components hold back the performance of your truck. These arms were designed with increased caster angle over stock to help with proper suspension geometry at full droop. 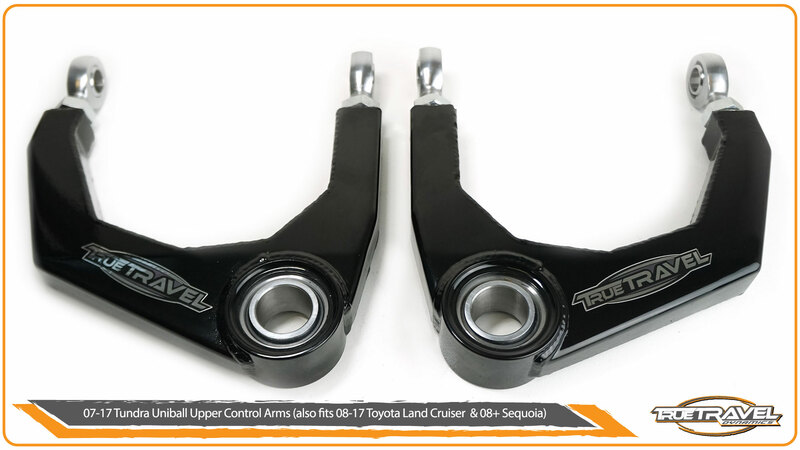 The boxed design of our upper arms features huge 1.5″ Military Grade stainless steel uniball bearings for a drastic increase in strength over stock components. 7/8″ heim joints are utilized on the frame side pivot to increase strength and adjustability. You’ll also get precision machined stainless steel misalignment spacers that allow your upper control arms to bolt directly to your factory spindle. All required hardware is provided with detailed step by step instructions for removal and installation. Absolutely no cutting or grinding is required, this is a 100% bolt on product. 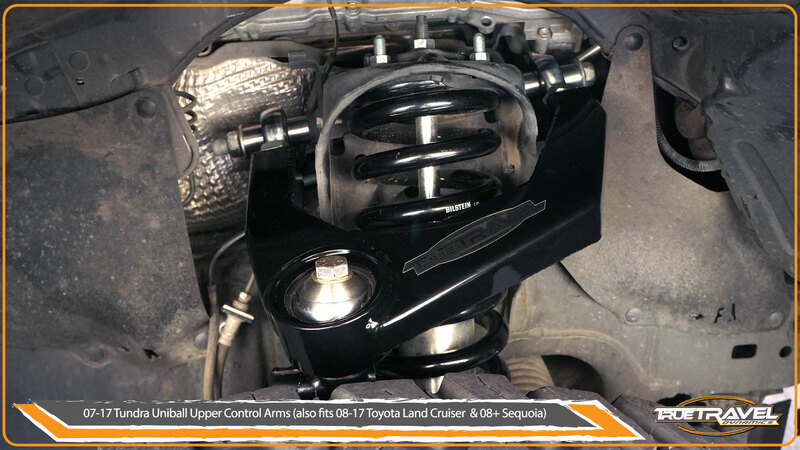 Finished in a 2 stage Gloss Black powder coat, your upper control arms will be protected from the elements no matter the terrain you encounter. 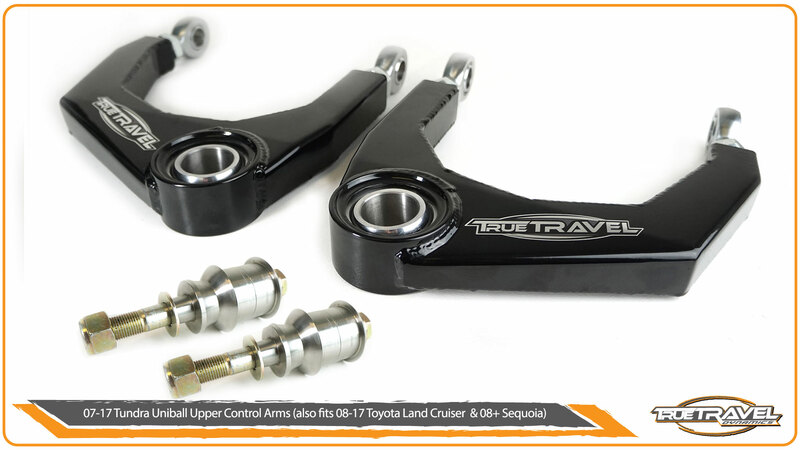 These upper control arms work with 2007 -2018 Tundras, 2008+ Sequoias and 2008-2018 Land Cruiser, both 2WD and 4WD models, and will increase wheel travel when you pair them with a set of aftermarket Coil-over shocks. Our UCAs will work on stock, leveled and lifted applications.